“You don’t build it for yourself. You know what the people want and you build it for them.” —Walt Disney (American film producer). Hailey is a wonderful client of mine who, before meeting me, had avoided presenting for 20 years of her career. Yes, that’s right: 20 years! She had even quit jobs to avoid presenting. Hailey worked as a counsellor for a major corporation. Her role was to support clients by giving both advice and care over the phone. She was fantastic at her job. She had received countless letters of support from her clients and their families, and was much loved. She was also very successful in increasing sales for the organisation through her commitment and drive. Much to her horror, Hailey was asked by her manager to begin a series of presentations across the country to the people who referred her service to their clients. Her role would be to explain what she did and to convince the referrers to continue to work with her by referring their clients to her as often as possible. Well, you can just imagine what she did! She told me that she could either quit her job or go to the GP to get a prescription for beta-blockers! Beta-blockers reduce the effect of excitement and physical exertion on the heart, reduce the dilation of blood vessels, and also reduce tremor and breakdown of glycogen. Neither of these choices, in my opinion, were the ideal solution! I think it’s amazing how, once you learn what you need to know about exceptional presenting, it’s not that nerve-racking after all. Don’t get me wrong: after five, two-hour coaching sessions and lots of rehearsing, Hailey was still what most people would call nervous, but she was also very excited and she knew she was ready for anything. Hailey knew she would do well with her presentations because she had put in a lot of planning and rehearsal, and she had crafted her script with her audience in mind. She knew she was going to convince the audience to send lots of clients her way. And just as she suspected, after avoiding presenting for 20 years she totally nailed her first presentation. Many people came to her at the end and commented on how impressed they were. They said things like, ‘You were the best presenter at this event’. What an outcome! It’s critical that you realise that talented presenters are made, not born! Successful influencers and presenters respect their audience, structure their message for their audience, and rehearse and master their craft. They do the work! What Hailey realised is that a fundamental technique for influencing others and for reducing your own nerves is to structure your message to meet the needs of your audience. This increases the chance they will do what you are asking them to do, which is wonderful for your own confidence levels. If you have a clear, well-structured, audience-focused message that convinces your audience, and you have designed it with a model that allows you to remember the information without relying on notes, then of course you will feel more confident — just like Hailey! Tip from Michelle Bowden: It’s important to structure your message in a way that meets the needs of all the people in your audience, not just the people with the same learning or listening style as you! The model that I suggest you might like to use when structuring your presentations was developed by Dr. Bernice McCarthy a world leading researcher, academic and educationalist. Dr. McCarthy drew on the various theories of adult learning proposed by psychologists and theorists throughout the ages such as Carl Jung, Jean Piaget, Kurt Lewin and David Kolb. She was passionate about both the diversity of learning styles and the various needs of the different learners in one classroom. In other words, she felt strongly that not all learners should be presented to in the same way. She created an instructional system that addresses the intrinsic needs of all audience types. Dr. McCarthy called her model the 4Mat System (see figure 3.1). 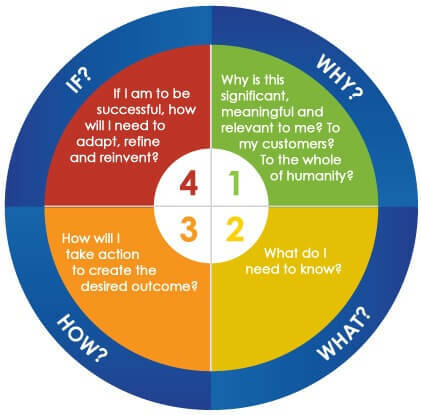 The 4Mat System recognises that individuals need to have four key questions answered (see below). In some cases the questions are explicit and known by the audience members and the presenter. In other cases the questions are more virtual in nature and therefore not yet conscious for either the presenter or the audience members. In most cases, by virtue of their personality and preferred learning style, audience members will be more likely to ask one of these four questions. In order to be convinced by your argument, they will need to have their primary question answered. This is not to say that they will not be interested in the other questions too. In order to capture the hearts and minds of all audience members, you will need to be sure that your presentation answers all four questions in a given order. What if? / What else? The audience member needs to know the alternatives for the new information so they can modify, adapt and create new contexts. They also need to know what will happen if they do and don’t take the action you have suggested. “All real change involves major uncertainty, and we cannot deny the questioning time to others simply because we have already answered the questions for ourselves.” Bernice McCarthy (creator 4Mat method). The question Why? is asked by most audience members at the beginning of presentations or meetings. When you answer Why? for your audience, you are helping them gain personal meaning and connect new information with personal experience. It helps your audience to establish the usefulness of the information in their lives. You are addressing questions like: Why should I listen? What’s in it for me? Why is this relevant to me in my life? When you answer the Why? question early in your presentation, you will engage people and they will be more motivated and inspired to listen to the rest of your message. The questions What if? and What else? are the final questions you should answer in your presentations. This is where you add your extra thoughts and information. It is where you tie up all the loose ends and remind your audience about your key messages. It’s also where you give the audience a chance to explore some of their questions in a question and answer session, and then close for action. Take the opportunity in this section to look outside the square for possibilities by answering questions such as, What if we did it this way instead? What else can we do to maximise the return on investment? What if XYZ happens##—##what will we do? What if we don’t do this at all? What if we do give it a try? What if? or What else? I think you will find this model to be common sense. You cover the Why? first because answering the Why? question will motivate your audience, so they are fully engaged by you and your message. You cover the What? next because the audience needs to hear your data and information. What? comes before How? because your audience can’t apply the information if they don’t know what it is! In other words, your audience needs to understand What? you are talking about, and the history and facts and statistics behind your content, before they can apply the information in a meaningful way. You cover the How? after you cover the What? because your audience is now motivated to listen, and they understand what you are talking about##—##the context of your message. They are now ready to think with you about the implications of your message and how things need to change. Finally you cover the What if? or What else? so you show your audience that you have all the bases covered. You also recap your main messages because, interestingly, we know that for most audiences, by the time they hear the summary, they’ve forgotten the beginning. Sad but true! So you should always tie things up for them, summarise, call them to action, answer their questions, point out the pros and cons of the message, and close with strength. It makes you think about the needs of your audience. It is much more thorough than just covering the part of the message that you find interesting — which, sadly, is what most people do. It doesn’t assume the audience wants to be there: it assumes you have some work to do to shift them, which is a realistic approach to your business presentations. It’s simple. There are only four questions to answer. It feels like common sense when you learn it, so it is logical and easy to remember and use. Where you can use the questions from the 4Mat System in your life? Coaching. To explain procedures and processes to staff. • Job interviews. To ask and answer questions. In fact, as a quick aside, many of my past training participants email me to let me know of their promotions. They explain that, thanks to the four questions, they can now answer interview questions beautifully! Personal communication. To communicate more clearly with your friends, children or partner. You really can use the four questions from the 4Mat System in so many situations. And, by the way, I firmly believe that the more you address the four questions in your personal communication at home, the easier you will find using them when necessary at work. I really love this audience-focused model and I recommend you use it when communicating in business. We hired custom home builder melbourne western suburbs to get our house in order before going to office. 1. Think of a communication or presentation you have coming up in the next few weeks. 2. Practise delivering your message addressing all of the Why? What? How? and What if? or What else? Questions in the correct order. 3. Notice how thorough this type of presentation is. 4. What do you see as the benefits of using this model for structuring your messages? For more information on how to present with confidence, clarity and influence please read How to Present: the ultimate guide to presenting your ideas and influencing people using techniques that actually work (Wiley) Or consider attending Michelle’s public 2-day Persuasive Presentation Skills Masterclass.